Let’s start with those on top. Sebo de Macho, for those (probably very few) who do not know yet, is solidified oil. Okay, I’m not sure if my term “solidified oil” is right but it is like that. Sebo is what we call the oil in food such as stew that solidifies when the food gets cold. It is used to reduce the appearance of scars. It is effective, but may take long to take effect. Its smell is the only thing I dislike about it. Since a kid and until now, I have used three pots. This could be the fourth that I had to throw away because the pot started to corrode and the corrosion spread to the sebo. In the middle, is a yellow tube of ointment for acne. It was an effective, painless, fast ointment to rid of it. Unfortunately, this was discontinued. I kept it just so I wouldn’t forget what it is in hopes it would be available in the market again. 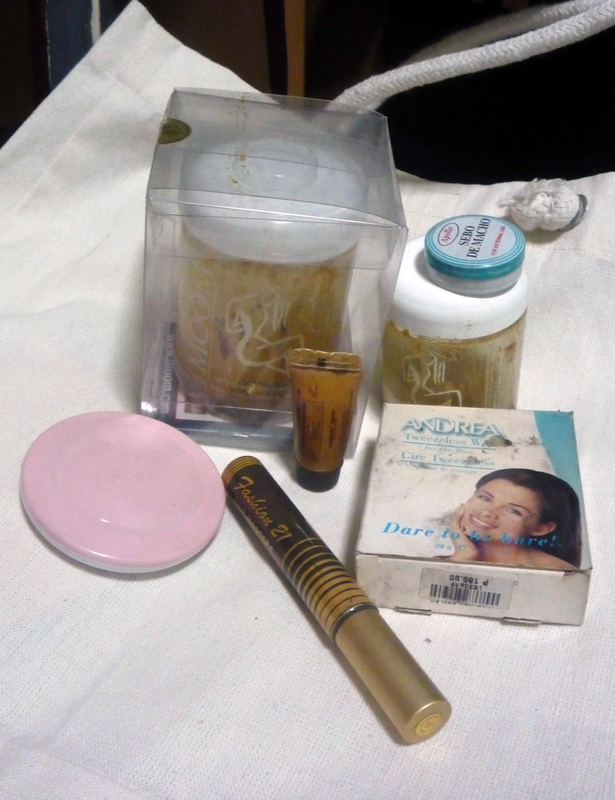 Bottom, left to right are face powder, hair mascara, and another hot wax for face. The face powder, which is probably the third I purchased of the same kind, has been in my stuff for years! Since high school at that. LOL I had oily face and I believed a face powder would help a lot. J&J was available almost anywhere, so that’s what I got. It is cheap although expensive for a student at that time. I forgot when I stopped using this brand of powder, but maybe when I started college or in second year. The hair mascara I got when I was in 3rd or 4th year high school. It is a temporary hair highlighter that works better for short hair. It quickly dries up as you brush along the hair. It applied flawlessly on the first two brushes then it became a fail. I don’t remember using this for something. I think I just wanted it. Last but not the last is the hair wax Andrea that was for my upper lip. If I remember right, I started waxing my upper lip before I got into waxing my legs. This face wax takes too much time and effort to use! Sticky and dirty too. Sticky because of the wax itself and dirty because its case would turn black when I would heat it with a candle. Do you also have stuff that you still keep such that you know must be thrown away already? I still have more to sort through. But more paper than beauty products.